After many years of "tank" controls, static camera angles and increasingly formulaic gameplay, Resident Evil creator Shinji Mikami knew it was time to reboot his franchise, so he and his team built Resident Evil 4 from the ground-up. 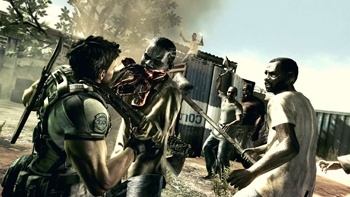 The studio axed the controls, camera angles, nonsensical puzzles and even the iconic zombies that had populated the franchise from the beginning, and fans welcomed the sweeping changes with praise. It's been four years since Resident Evil 4, though, and we've enjoyed two Resident Evil games that are rooted in its fundamental design. Most recently, the publisher released Resident Evil 5, a gorgeous, action-packed game that plays more or less just like its predecessor. As entertaining as the game is, however, it definitely feels quite familiar. Fans were outspoken about the familiarity, and Capcom responded, saying that the next Resident Evil game will bring many new changes to the series. So, what changes should be made and in what direction should Capcom take Resident Evil from here? There are many directions it can go. The franchise is sort of at a split in the road. After Resident Evil 4 and 5, it's difficult to even call the series a survival horror franchise anymore. Really, Resident Evil 5 plays more like an action game than it does a horror title. Should the franchise continue down this road of delivering action-packed thrills instead of frightening chills? I don't think so. The next Resident Evil should absolutely return the series to its roots in the sense that it must be atmospheric, creepy and frightening. One of the ways that Capcom can accomplish creating a scarier experience is by reconsidering its approach to storytelling. The over-the-top, cinematic Metal Gear Solid 4-style cut-scenes of Resident Evil 5 are nice, but they aren't the most immersive way of telling a story, especially one that should be frightening. The next Resident Evil should take a cue from the talent at Valve and mimic the Half-Life series' storytelling technique. That is, abandon cut-scenes, or at least don't use them heavily. Use in-game storytelling as much as possible. Perhaps even use a dialogue system that allows you to interact with other characters in the game. If not, at least tell the story through gameplay, not cut-scenes. By using in-game storytelling, you'd be kept in a constant atmosphere, which means you're more likely to become immersed and affected by the game's environment and atmosphere. For a game to be frightening, its setting has to be right. Since Resident Evil 4, the series has moved away from the dark, claustrophobic hallways and corridors that made the series so creepy in the first place. The next [i]Resident Evil</i. should be dark, dark, dark. No more African desert at noon, with so much sun that the game's characters are likely more worried about getting a bad sunburn than being eaten alive by whatever non-zombies are infested the surrounding area.